Japanese culture has always been elusive, shrouded in misconceptions and stereotypes. The phrase conjures images in the mind of iconic animations, picture-perfect scenes of Mount Fuji and the conspicuous appearance of the geisha. Historical and media accounts of life in Japan continue to perpetuate these readymade images, with Wes Anderson’s recent film Isle of Dogs coming under fire for subscribing to this stereotypical model of Japanese culture. Borne out of this misconception, as it leaves footprints of cultural fictions across the globe, came the project Japan House. With a vision to educate and facilitate a more nuanced understanding of life in Japan, it is creating a number of hubs in major global cities. London is the third city to host Japan House. Through performance, food and drink, retail, exhibitions and a library, Japan House London will bring the city a unique, authentic insight into Japanese culture. In order to fulfil this ambitious proposition, Japan House London needed an architect who could build this idea. In Katayama Masamichi, principal of Wonderwall, it found a shared vision and the potential to make this a reality. The design of Japan House London is built around the idea of the ‘void’ and ‘emptiness’. In Japanese culture, a void is not empty space but open space. Referred to as ‘Ma’, the idea is temporal. It is can be illustrated by the pauses in a conversation. Although they are perceived as silences, they can say a lot. ‘Ma’ asks the observer to see spaces between objects for what they provide and not the gaps they leave. Central to the space is a monumental steel staircase, wrapping around a glass tube lift. This connection provides openness between the three floors, through a void that provides a moment to pause. It is an exemplar of the ‘Ma’ notion. It was so important to the design that it was custom-made in Japan and shipped to London, where it was assembled piece by piece. Masamichi’s design for the restaurant is rooted in the Japanese space, doma. In Japanese houses, where you must take off your shoes to enter, the doma is the area between the indoor and outdoors that forms a threshold. Visitors can keep their shoes on here and are allowed a space to gather and talk. A doma usually has a kitchen, which creates a sensual experience of sights, sounds and smells. A grill will crackle in the background of neighbours chatting and laughing against the warmth of a fire. Japan House London’s restaurant contextualises this idea. ‘You can see the sake bar and you can come in and have a chat there. Then you can come into the restaurant and from there see the kitchen where you can see and hear the Japanese barbecue,’ Masamichi says: The idea is ingrained in a sense of community and the blurring of the public and private space. Away from the main restaurant, is a traditional tatami room. Thick, woven straw tatami mats, from where the room takes its name, line the floor. The windowless enclosure is offered as a tranquil, private dining room, hidden away from the busy main space. The shop at Japan House London encompasses the entire ground floor. 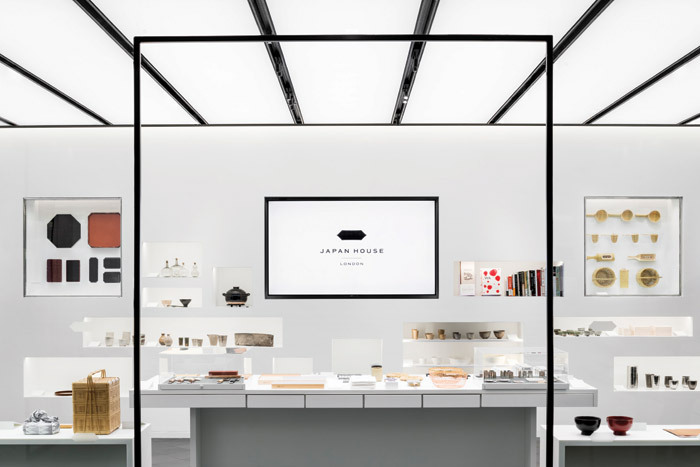 It presents a carefully curated selection of Japanese products, presented in a gallery format that celebrates the artists and designers behind them, fixing them into the historical and social context that Japan House seeks to celebrate. Haba Yoshitaka of BACH has curated a library at Japan House London that provides a revolutionary book display, in an increasingly digital world, intended to encourage visitors to pick up and engage with the books. The book display will change periodically, while the most recent display is around the theme of Japan’s ‘mingei’ folk art movement that developed in the Twenties. On the lower ground floor is the exhibition space. 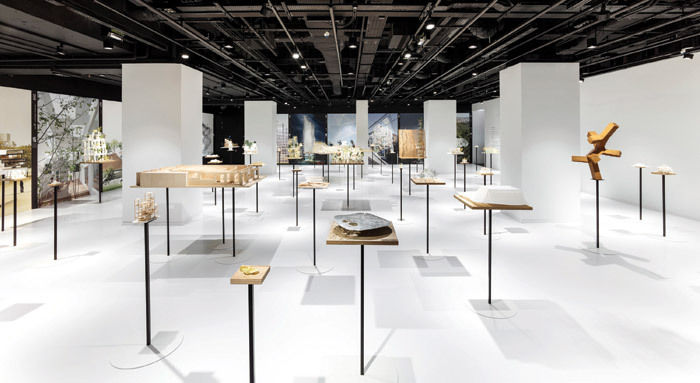 Being inaugurated by Sou Fujimoto’s Futures of the Future exhibition, the gallery celebrated not what the Japanese architect did – but what he didn’t do. It reflected on his unrealised works, alongside a few of his seminal structures, such as the 2013 Serpentine Pavilion. The gallery’s second exhibition, The Biology of Metal: Metal Craftsmanship in Tsubame-Sanjo, which opened in September, delves into a lesser-known aspect of Japanese design. It looks at the northern Japanese district home to the small metalworking factories and workshops that distribute their products and skills around the world – from the majority of Japan’s specialist cutlery to the metal-polishing techniques used to create Apple’s iPod casings. Alongside the extensive gallery and library space is The Hall. 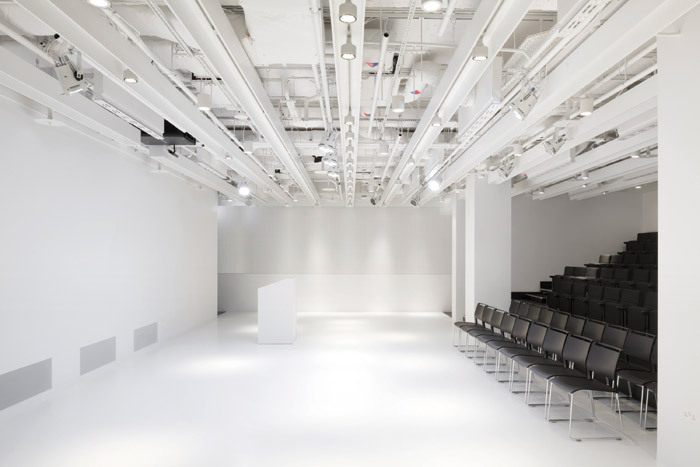 The open room provides flexibility to deliver lectures, seminars and shows in conjunction with the exhibitions held in the main gallery space. 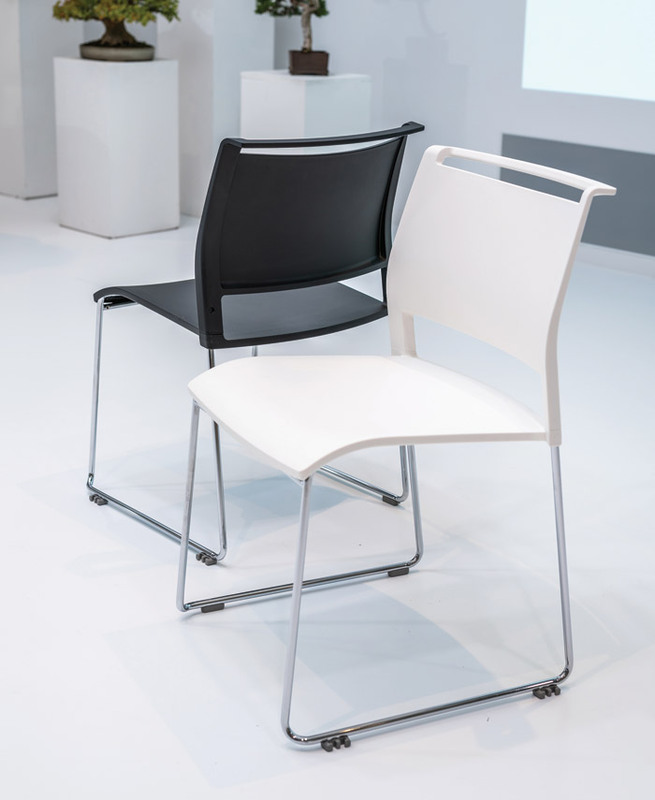 The Hall is a blank canvas, made practical by KI’s Opt4 chairs – a simple, refined chair which allows high-density stacking, so the space can be immediately transformed. The beauty in this project isn’t in one aspect alone. It isn’t in the restaurant, the shop, the library, the exhibition space or even in the serene tatami room. Japan House London is beautiful in the entirety of the project – so much more than just a sum of its parts. Masamichi put it best when asked what his favourite aspect of the design was he remarked, ‘I would say the entire space’.